You know what a shootout is, don’t you? You grew up watching them in westerns on TV. The idea behind a shootout hasn’t changed much since Matt Dillon opened “Gunsmoke” in a hail of bullets. The plot is always the same. The rivals come face to face, and the winner is determined by who draws the fastest, shoots the straightest and doesn’t succumb to nerves. The winner is the last man standing. And so it goes with motocross bikes. If should be noted that “MXA’s 2016 Shootout” features the broadest array of machines we have ever tested. They vary in horsepower, weight, handling and suspension performance by incredible margins. If you want the lightest bike made, it’s here. If you want the most powerful bike made, it’s here. If you want the best-shifting bike made, it’s here. If you want a yellow bike with a black fender, it’s here. 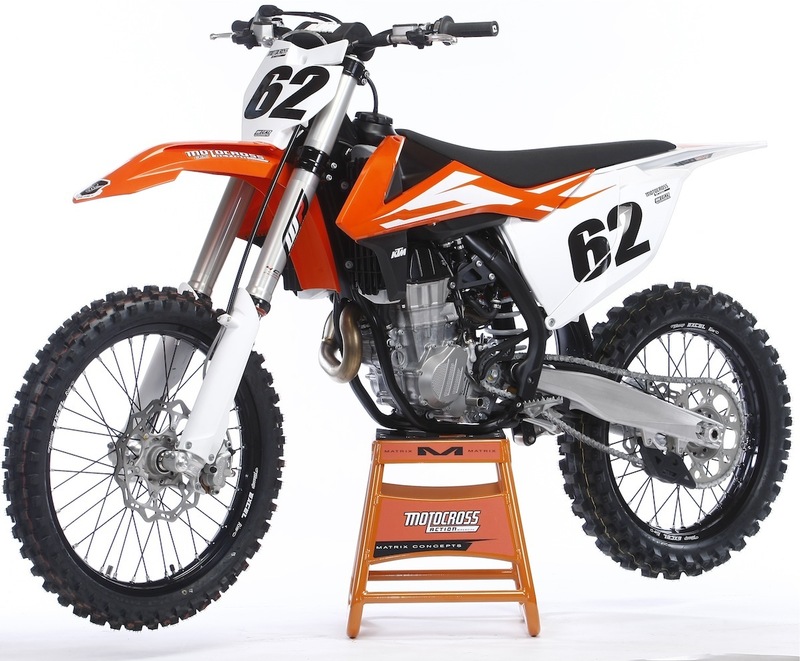 We did not include the 2016 KTM 350SXF in MXA’s 450 Shootout because it is not a 450cc bike. Plain and simple. 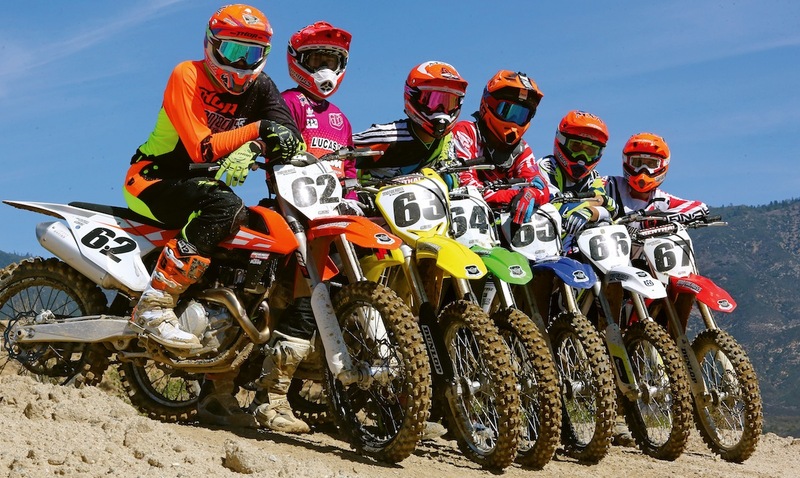 For the 2016 MXA 450 Shootout, it is important to note that even the MXA test riders don’t believe that there is a perfect bike—proven by the fact that they often choose to race bikes that they gave a low rating to in the shootout because they suit their style better than the bikes they rated higher. We’ve tried to give you a healthy understanding of each bike’s good and bad attributes. After that, the choice is up to you. You’ve probably read lots of 450 Shootouts on these six bikes already—but this is the only one that you should believe in. We didn’t do it in one day (and lots of them were done that way). We didn’t do it by practice riding the bikes (and most of them are done that way). We didn’t depend on manufacturers’ claimed weights or horsepower (most shootout don’t dyno the bikes or weigh them for themselves). Instead, we tested these bikes non-stop for six months. We raced these six bikes every week (and we had 10 different test riders on them from Pro’s to Joe’s). We worked on them feverishly, trying different gearing, suspension settings and fixes for problem areas. We dyno’ed every bike, often several times, and we weighed them with their gas tanks empty. Most of all—we followed through. We wanted to be as accurate as humanly possible. That doesn’t mean that you are going to love our results—but we can live with that. WHY SHOULD THE RM-Z450 WIN THE SHOOTOUT? Do you think that changing a stripe on the radiator wing from red to white counts as a performance mod? We don’t, either. The Suzuki’s one claim to fame is that it is the best-cornering bike ever made. The rest of the bike is not bad; it’s just not outstanding in any area. WHY SHOULD THE RM-Z450 LOSE THE SHOOTOUT? The RM-Z has the worst forks on any bike sold in 2016. You might think, as we did, that Suzuki’s SFF TAC Air forks would be kissing cousins to Kawasaki’s TAC forks. Not so. They are different mechanically and in performance. Every MXA test rider liked the KX450F’s TAC forks and none liked Suzuki’s version. The 2016 RM-Z450 is also the heaviest bike in this shootout, fifth on the horsepower chart, equipped with the worst brakes and looks like it was designed in 2008. HOW MUCH HORSEPOWER DOES THE RM-Z450 MAKE? 54.88 horsepower at 9200 rpm. It makes 36.03 foot-pounds of torque. Every MXA test rider likes this engine, but none of them love it. The RM-Z450 produces a very clean-running powerband that works best from low to mid. It’s not especially fast, but the power is perfectly placed. It should be noted that at no point does the RM-Z450 feel like it has more power than the bikes around it. That’s because it doesn’t. Why do we forgive Honda for failing to play the horsepower game but not Suzuki. That’s simple. Honda did it on purpose. They had a reason for wanting a slow bike and boldly stated so. We don’t think Suzuki had such lofty, if misguided, intentions with the RM-Z450. Just as with the 2016 CRF450, you can win races on the RM-Z450 while giving up 3 or more horses—it’s just that Suzuki isn’t holding up its end of the bargain. WHAT DOES THE RM-Z450 WEIGH? 240 pounds. Yikes! And that’s with air forks. 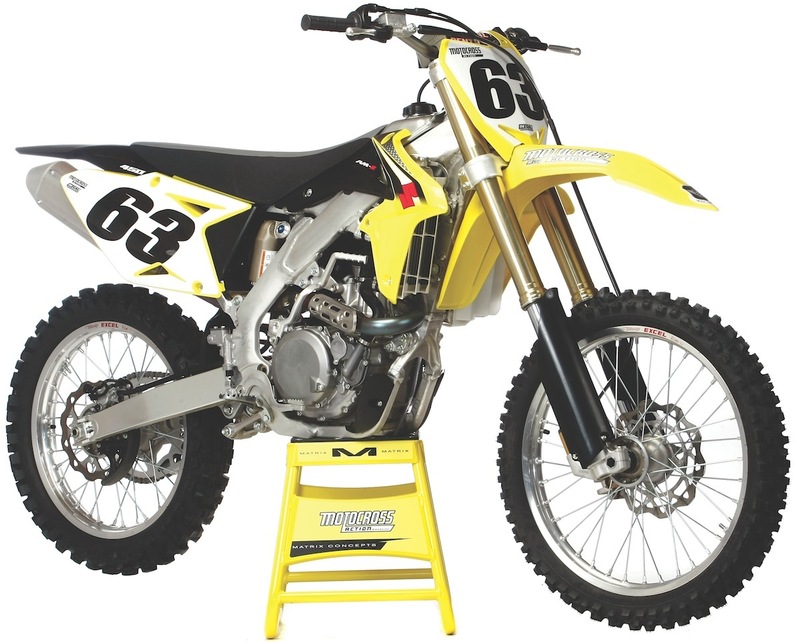 The RM-Z450 has been the heaviest bike for many years. In fact, five years ago it hit MXA’s scales at 244 pounds. WHERE DID IT PLACE IN LAST YEAR’S MXA SHOOTOUT? Fifth. And, white stripe or not, Suzuki can’t expect to improve on last year’s shootout finish with a bike that has seen no fundamental improvements. Power output: Average. The key to success on the RM-Z450 is to shift at the perfect spot on the curve. Where is that spot? 9000 rpm. 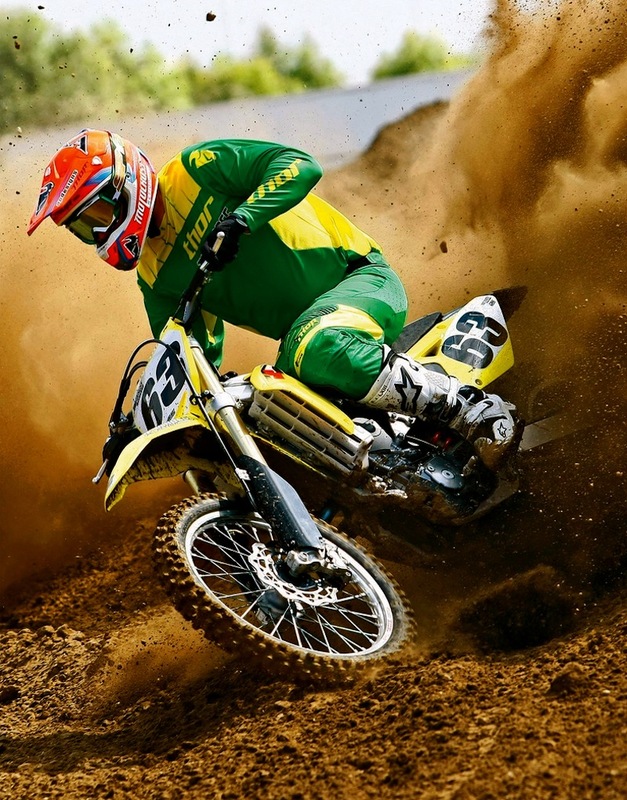 After 9000 rpm, the RM-Z450 can’t run with horsepower beasts like the 450SXF, FC450 or YZ450F. If you try to play the high-rpm game, they will shut you down. Forks: It’s hard to get past how difficult the TAC forks are to live with for what turns out to be average but spiky, performance. They are harsh in the mid-stroke and get even harsher after that. Send them out to be re-valved—immediately. Shock: Suzuki’s shock setup is in the ballpark, but you’ll never know it until you get the forks to work. Overall handling: Suzukis have been twitchy since 1982‚ and Suzuki is proud of it. There is no doubt that the 2016 RM-Z450 is unsettled at speed, but you gotta give stability to get great cornering prowess. The RM-Z450 is at its best in Supercross, Arenacross or fairground-style tracks. As an outdoor bike, on a rough track with big bumps and high speeds, it is busy. Cornering: Great. If you’ve never been very good at cornering, an RM-Z450 will fix that. Shifting: We take our time, breathe the engine and use the clutch. Brakes: When you build the heaviest bike on the track, you need powerful brakes. Suzuki’s brakes are more tricycle than locomotive. Clutch: We think we felt it slip going over the threshold at the dealership. WHAT WOULD WE CHANGE ON THE RM-Z450? Where to start? We would take the handlebars off and redesign everything under them. WHAT’S NEWSWORTHY ON THE RM-Z450? Suzuki is the only manufacturer with three launch control settings. Plus, it has three ECU map plug-ins. Did we mention the white stripe? Senility. This is an old-school bike that saw its best days back when it still had a Keihin FCR carburetor. WHY SHOULD THE CRF450 WIN THE SHOOTOUT? 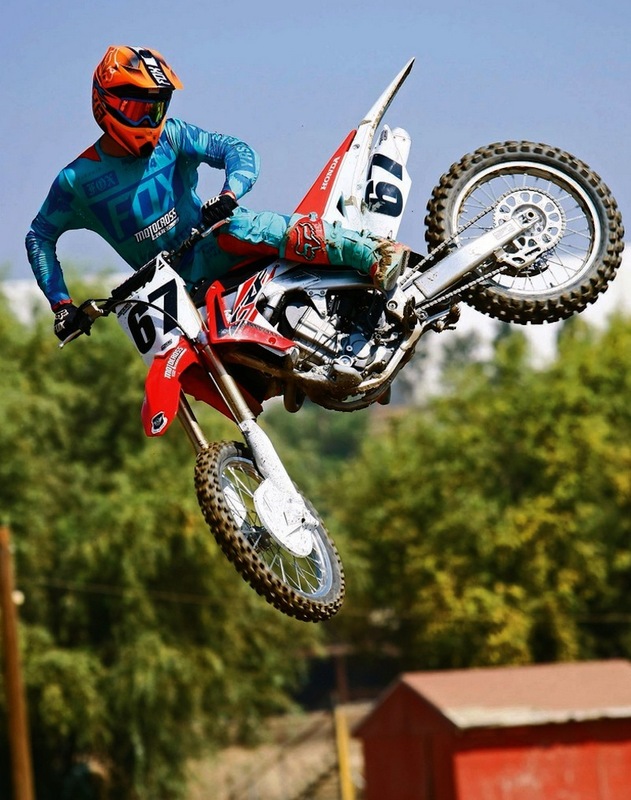 The CRF450 should win “MXA’s 2016 Novice Class Shootout” because it’s slow, and so are most Novices. But in the real world, the 2016 Honda CRF450 didn’t stand a chance of winning the 2016 MXA 450 Shootout. Why not? It didn’t win last year’s shootout, and it is unchanged for 2016. WHY SHOULD THE CRF450 LOSE THE SHOOTOUT? A bike doesn’t have to make the most horsepower to win a shootout—if it has other virtues. Unfortunately, the 2016 Honda CRF is short on virtues. It makes almost 5 horsepower less than the class leader, is no longer the lightest bike (by 6 pounds) and has a spongy clutch, horsepower that peaks at a lowly 8600 rpm and questionable PSF-2 forks. HOW MUCH HORSEPOWER DOES THE CRF450 MAKE? 53.03 horsepower at 8600 rpm—the least of any 450cc production bike. It makes 33.63 foot-pounds of torque—the least of any 450cc production bike. The 2016 CRF450 has a unique powerband. It is lively off the bottom, progressive in the midrange and flat as a pancake on top. Remember where we said that the CRF450 made almost 5 horsepower less at peak than the KTM 450SXF? Well, after its 8600 rpm peak, the CRF450 makes 6 horsepower less than the KTM at 9000 rpm, 7.25 horsepower less at 10,000 rpm and 7 horsepower less at 11,000 rpm. 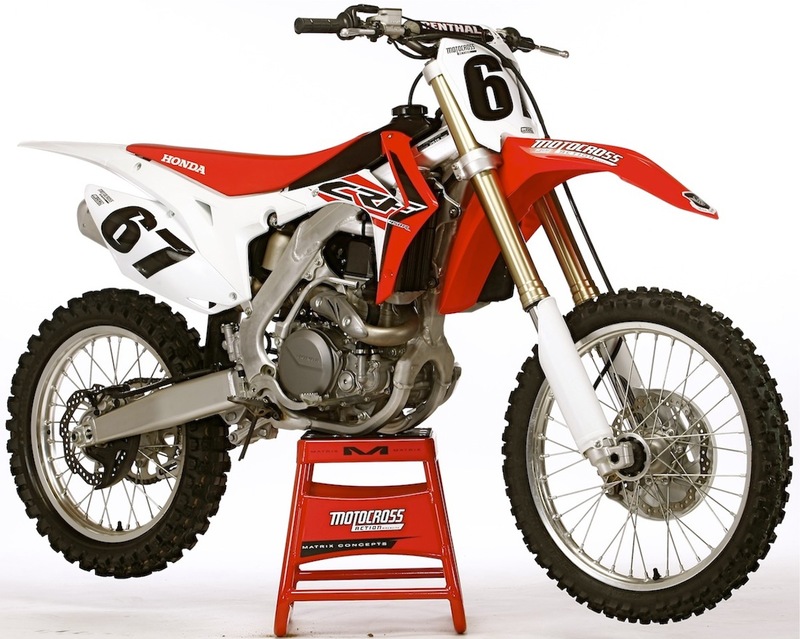 WHAT DOES THE CRF450 WEIGH? 233 pounds. There was a time when the CRF450 weighed 231 pounds, but even with 2-pound lighter Kayaba PSF-2 air forks it has gained weight. The culprit? The useless twin pipes. Sixth place. So how did the CRF450 leapfrog from last place a year ago to second-to-last this year? Given the almost identical poor performance of the CRF450 and RM-Z450, we gave the nod to the Honda because it is a modern design, while the Suzuki is an old-school, 240-pound machine from the last decade. Power output: Pleasant. The CRF450 engine is very tractable, well modulated and pleasant to ride. It produces what MXA test riders referred to as a no-hurry style of power. Because it revs predictably, the powerband is quite usable and is well suited to the typical local motocross racer. However, it is strictly a low-to-mid powerplant. Forks: Honda’s Kayaba PSF-2 forks are a blend of WP 4CS forks (with the rebound damping in one fork leg and compression in the other) and the previous low-pressure PSF air fork. These forks are not very good. Shock: We think the shock spring is too soft for anyone over 190 pounds, but, if that isn’t you, don’t sweat it. Overall handling: This is a bike that wants to do things right but seems unsettled most of the time. When traction is good, it can carve. Cornering: Honda didn’t have the budget for a new frame for 2016 (Honda is saving the money for 2017), so the engineers lengthened the forks to slacken the head angle. While this should have hurt the cornering ability of the CRF450, it actually helped by calming down the twitch at speed. Shifting: A decade ago this was a great gearbox; now it’s just average. Brakes: The big rotor helped the CRF450 in the pucker power department, but the brakes still aren’t as good as KTM, Husky or Yamaha brakes. At least Honda did something—unlike Suzuki. Clutch: As much as we don’t like the sponginess, we hate the hair-trigger actuation point that offers no feel. If you’ve ever sufferd “falme-out” on a Honda and blamed it on the fuel mapping, know that the trigger-action clutch is a big contributor. WHAT WOULD WE CHANGE ON THE CRF450? That’s easy. We’d lose the dual pipes (and save 3 pounds). We’d update the clutch from its 2008 roots, find the long-gone horsepower and spec coil-spring forks (or a version of the KX450F’s Showa TAC forks). WHAT’S NEWSWORTHY ON THE CRF450? There is nothing newsworthy on the 2016 CRF450. It is basically the 2015 CRF450 with 5mm-longer forks. Why does it have longer forks? Because Honda didn’t have the budget to build a new frame to cure the twitchy front end, so they spec’ed longer forks to raise the front end and slacken the head angle. What is semi-newsworthy is that the CRF450 is in the fourth year of its four-year production cycle and there will be a new model in 2017. Wait. There’s always next year. WHY SHOULD THE YZ450F WIN THE SHOOTOUT? The Yamaha has three attributes that no other machine can touch. (1) Yamaha’s SSS suspension is leaps and bounds ahead of the other offerings. It has good damping, reasonable seal life and the proper spring rates. (2) It kicks in an afterburner above 9000 rpm that makes it a holeshot machine. (3) The YZ450F is bulletproof. In MXA’s experience, it can take a licking and keep on ticking. WHY SHOULD THE YZ450F LOSE THE SHOOTOUT? Although it is fast, reliable and super suspended. It is heavy bike (11 pound heavier than the KTM). Worse, it feels heavy. It sits very high, the handling is odd as best, the engine isn’t as easy to use as what KTM and Husky offer and the YZ450F is vague in the corners. HOW MUCH HORSEPOWER DOES THE YZ450F MAKE? 56.85 horsepower at 9800 rpm. It makes 34.91 foot-pounds of torque. This is the ultimate machine for going flat out. It is better off the bottom than in 2015 and still a romper at high rpm. WHAT DOES THE YZ450F WEIGH? 238 pounds. That is 11 pounds heavier than a KTM 450SXF. That’s a lot of Ti bolts and gold coins. None of Yamaha’s 2016 updates addressed the weight issue; it is the second-heaviest bike in the shootout. Third. The YZ450F lost a spot from its 2015 finish, but that is to be expected when the Yamaha engineers didn’t make any earth-shattering improvements and their competitors did. Power output: Very good. The 2016 Yamaha YZ450F got a new cam and revised mapping to fill in the bottom of the powerband where the previous YZ450Fs were weak. The added bottom took away some of the jumpy bark that wreaked havoc on the YZ450F chassis at turn-in—but not all of it. What you get with the 2016 YZ450F is an engine that works better in the slower sections of the track that is still a rocket ship above 9000 rpm. Forks: Magnificent. If you want works-like forks without any of the hassles of air pumps, the YZ450F’s forks are the best forks on the track. Hands down. Shock: If you are over 200 pounds, you won’t like Yamaha’s change from last year’s 58 N/m shock spring to this year’s 56 N/m spring, but everyone else will. Overall handling: Yamaha made a boatload of geometry changes to the 2016 YZ450F—to little effect. 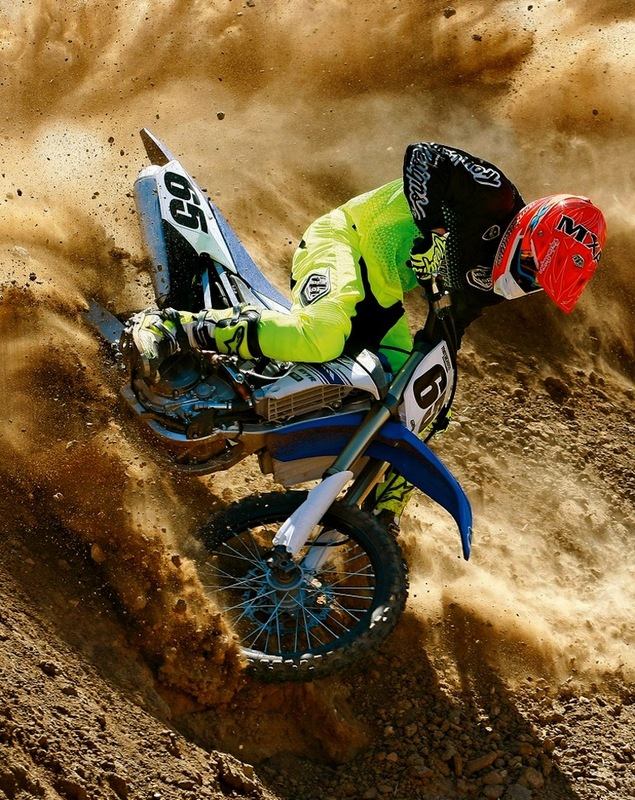 We don’t blame any rider who has issues with the way the YZ feels on the entrance of flat or sweeping turns. But, any rider with a handful of tools and an afternoon of riding time can nibble away at the loose feeling with the adjustments listed below. Cornering: It was still vague at tip-in and tends to push on flat corners. This could be mediated by sliding the fork up in the clamps, swapping the stock Dunlop MX52 for a better tire, lowering the rear sag from 100mm to 103mm, and turning the high-speed compression out a half turn and the rebound in 5 clicks. Shifting: Our biggest shifting issue has alway been on the upshift from second to third. 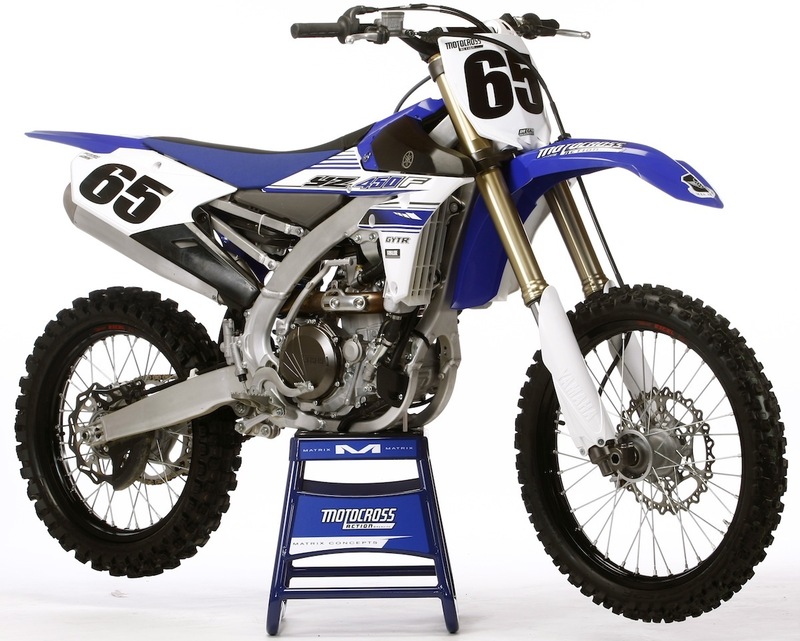 Brakes: In 2016, the Yamaha YZ450F gets a 270mm front rotor. As expected, stronger brakes boost stopping power, but they also help settle the YZ450F chassis at turn-in, on off-cambers and in direction changes. Clutch: The best of the cable-operated, non-hydraulic, coil-spring, Japanese-brand clutches. That is a nice way of saying it is the leader of the duds. WHAT WOULD WE CHANGE ON THE YZ450F? If we could redesign the YZ450F, we would start with the plastic pieces, especially the clumsy airbox and the radiator wings. We’d replace the airbox cover’s Dzus fasteners with something that doesn’t fall out. We’d lower the gearing from 48 teeth to 49. And, it goes without saying that the YZ450F needs to lose 11 pounds just to stay in the game. The weight is a big downer, especially on a bike designed to take advantage of centralization of mass. It would cost a consumer thousands of dollars to knock off the 11-pound disadvantage it has to the KTM (and we promise you that you can feel 11 pounds on the track). WHAT’S NEWSWORTHY ON THE YZ450F? Selected. It has an improved powerband, awesome suspension, updated brakes and world renowned reliability. But, it’s not without flaws, quirks and peccadillos that relegate it to the status of an acquired taste. WHY SHOULD THE KX450F WIN THE SHOOTOUT? Largely because we said Kawasaki would if it built a lower, lighter and sleeker bike that didn’t have weak brakes, a marginal clutch, stodgy upright handling, obnoxious sound, mediocre forks and a famously weak chain guide. And that is exactly what Kawasaki did in 2016, except for the “marginal clutch” and “famously weak chain guide” part. WHY SHOULD THE KX450F LOSE THE SHOOTOUT? 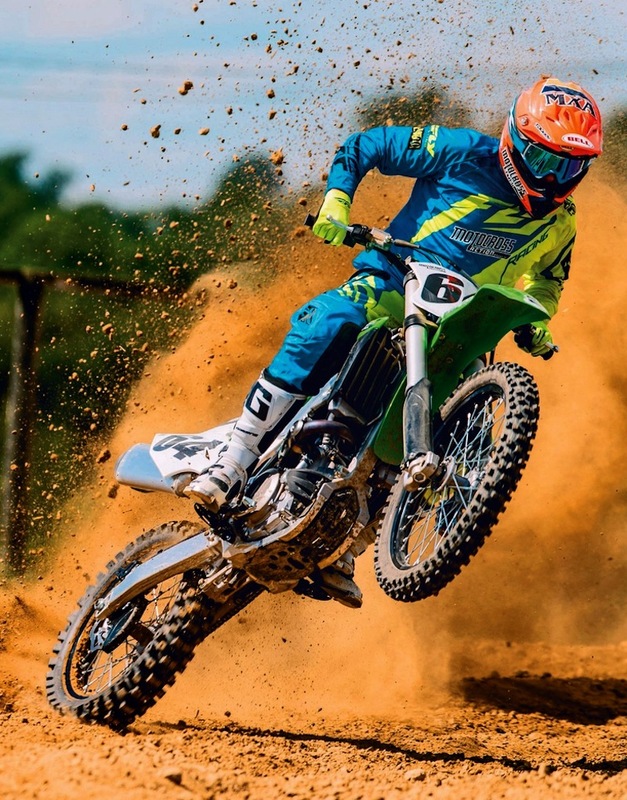 Even though the 2016 Kawasaki KX450F is a lighter, thinner, lower and better handling bike than any KX450F ever made, the MXA wrecking crew reneged on the deal for it to win the shootout. Why? We’re not as thrilled with the overall power output of the 2016 KX450F. It’s easier to ride but not as fast. Our KX450F popped on deceleration and pinged late in the motos. We tried 10 different maps and couldn’t fix it. We finally settled on the black coupler. And “marginal” is still an accurate description of the clutch. HOW MUCH HORSEPOWER DOES THE KX450F MAKE? 55.43 horsepower at 9300 rpm. It makes 35.79 foot-pounds of torque. Historically, the KX450F has been the horsepower king; however, in 2016, Yamaha, KTM and Husqvarna eclipsed it by 2 to 3 horsepower. That doesn’t mean that the 2016 KX450F engine is slow. It isn’t. It also doesn’t mean that it is blazing fast. It isn’t. 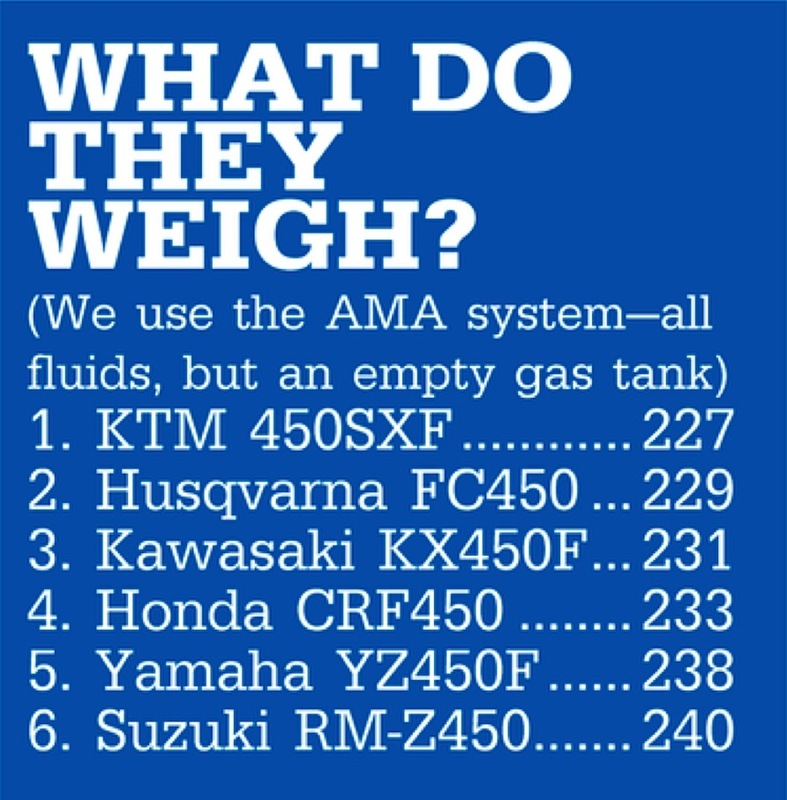 WHAT DOES THE KX450F WEIGH? 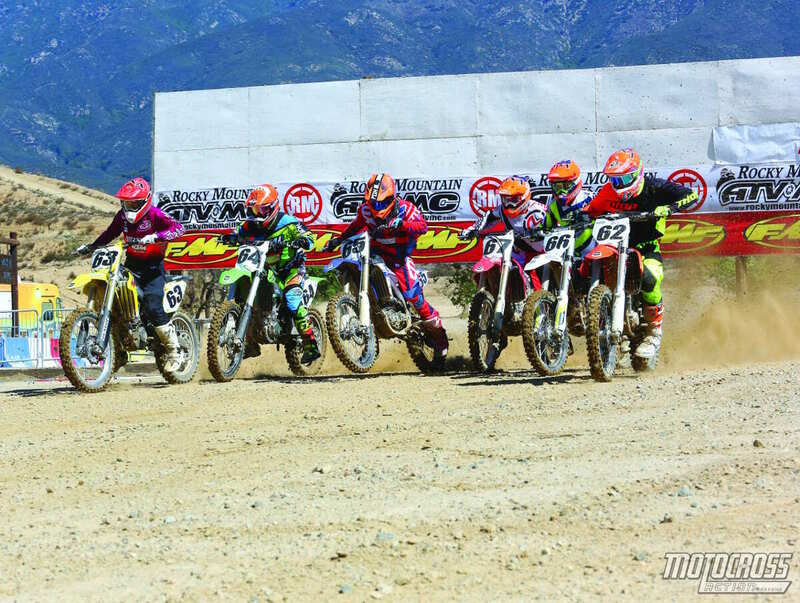 Power output: We miss the halcyon days of 2012 when the KX450F made the most power in the 450 class. For 2016 it ranks fourth in peak horsepower and delivers a very deliberate but uninspiring style of power. Forks: These are really good air forks. We never thought we’d say that about Showa TAC forks. Whether we were setting them up for an AMA Pro or a portly Vet Novice, we got them in the sweet spot quickly (in sharp contrast to the SFF TAC forks on the 2016 Suzuki RM-Z450). Shock: The shock was a surprise. It worked well from day one, and although we went out on several settings and ran the race sag at a relatively low 105mm, we liked the improvements to the rear suspension. Overall handling: Would it sound rude to say that the 2016 Kawasaki KX450F handles nothing like any previous KX450F? The mellow engine, light weight, narrower chassis and improved geometry elevate the KX450F chassis out of its cellar-dweller prison. Cornering: All previous KX450F’s were stodgy, upright machines that turned via brute force. Not the 2016 KX450F. It wants to turn. Okay, maybe it wants to turn a little too much—as it exhibited looseness on the entrance to corners—but we will take that over a bike that fights you in every corner. A front tire change, to the MX32 that comes stock on the KTM, will calm the steering response. Shifting: Mediocre. It feels stiff and doesn’t always reassure you on the upshift from second to third. Brakes: Good. The 270mm front rotor was a great addition to the KX450F package, but we still had to bleed the brakes after the first hour to eliminate sponginess. Clutch: Iffy. If you are a clutch abuser, or even a moderate user, you will eat this clutch alive. WHAT WOULD WE CHANGE ON THE KX450F? The popping is irritating; this issue needs further investigation at the factory. We’d dropkick the front tire for a Dunlop MX32 or Bridgestone X30. 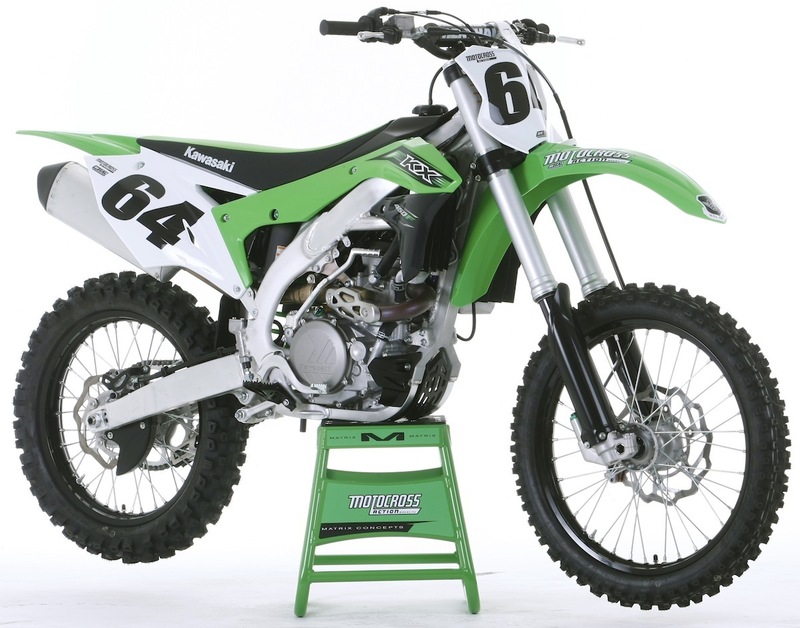 We believe that aftermarket KX450F plastic will have a higher oil content and be less brittle. WHAT’S NEWSWORTHY ON THE KX450F? Thanks to its lighter weight, flatter seat, narrower tank and more balanced chassis, the 2016 Kawasaki KX450F is the anti-KX450F that we all dreamed of. It will erase the old memories of the heavy ocean liner that needed a harbor master and a tug boat to get around a corner. Not perfect, but far from flawed. Reexamined. Why did it take them so long to rectify the errors that every KX450F racer already knew about? WHY SHOULD THE FC450 WIN THE SHOOTOUT? 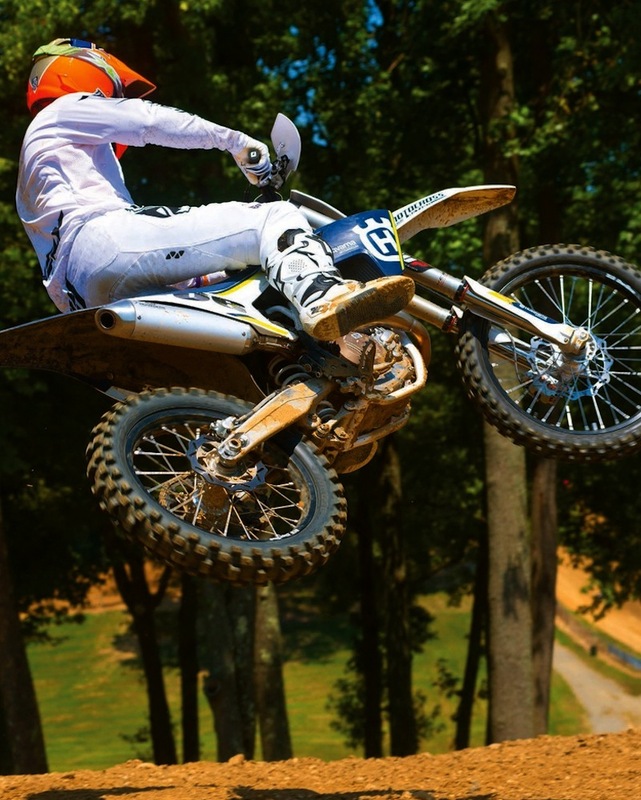 Given that the 2016 Husqvarna FC450 shares its major components with the 2016 KTM 450SXF, you might assume that it would tie for first place with its orange brother, second cousin or adopted parents. After all, it has the same brakes, handling, electric starter, diaphragm clutch and light weight. 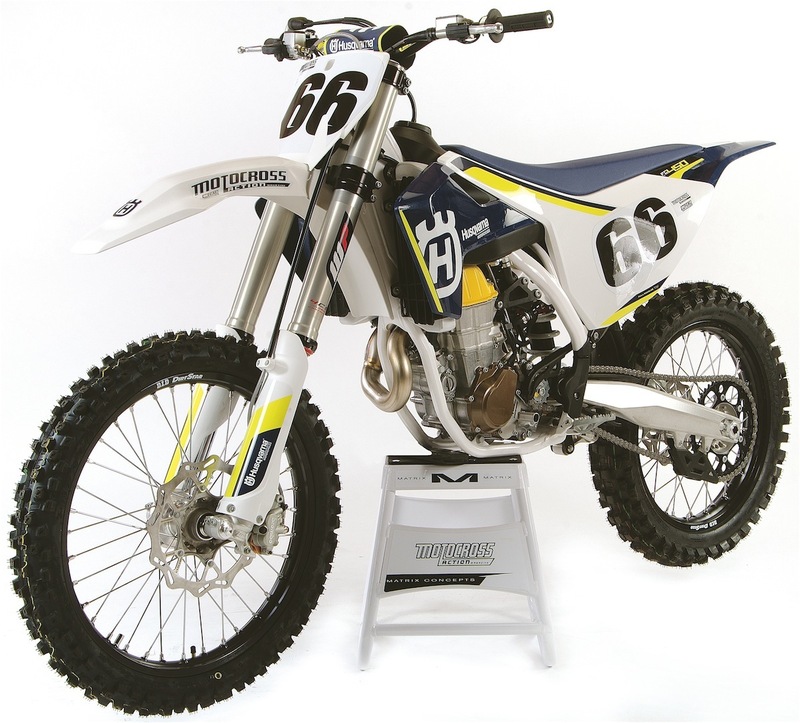 Those are good reasons to choose the Husqvarna FC450 as the co-winner, but not good enough. WHY SHOULD THE FC450 LOSE THE SHOOTOUT? Husqvarna’s engineers could easily have given the Husky the same power output as the 2016 KTM 450SXF, but they choked down their muffler and designed an asthmatic plastic airbox. These two choices cost the FC450 1.0 to 1.25 horsepower at 5000, 6000, 7000, 8000, 9000, 10,000 and 11,000 rpm. It’s one thing to give up 1 horsepower at peak, but a completely different thing to give up 1 horsepower at every step on the curve from bottom to top. Also, the airbox and muffler add 2 pounds to the bike, making it the second-lightest bike in this shootout (when it should weigh 227 pounds like the KTM 450SXF). HOW MUCH HORSEPOWER DOES THE FC450 MAKE? 57.14 horsepower at 9300 rpm. It makes 35.86 foot-pounds of torque. The Husky has a lap-time engine, not a sprint engine. Test riders could push the FC450 without fear of being bucked off by a sudden burp of testosterone from the powerplant. This style of power has pluses and minuses. The powerband was long, broad and pulled forever, but it didn’t have the quick rev and lively throttle response of its KTM sibling, which made the Husky easier to ride. And, just to be perfectly clear, the Husky makes a lot more peak horsepower than the 2016 Honda, Suzuki, Kawasaki or Yamaha. WHAT DOES THE FC450 WEIGH? 229 pounds. The 2-pound weight penalty comes from the molded airbox and restrictive muffler. Second place. 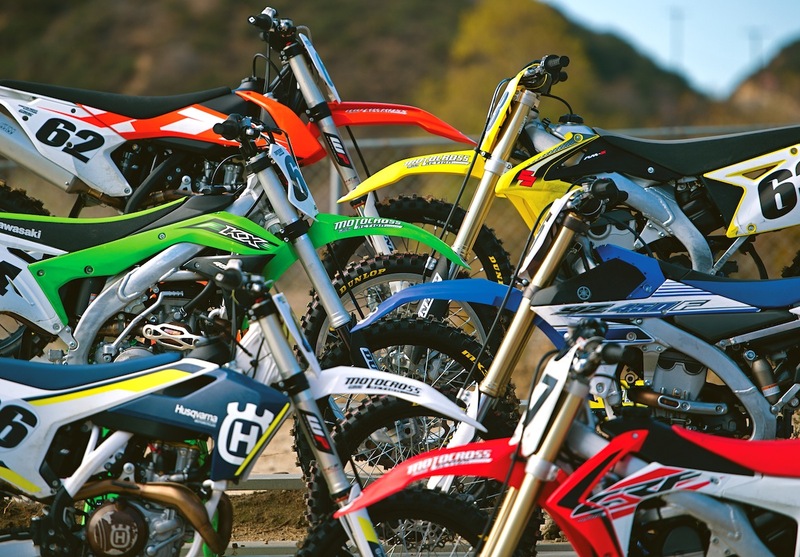 Just like last year, the 2016 Husky FC450 piggybacked into second place—for the same reasons. Power output: Excellent. The FC450’s power is broad and ultra usable. It revs slower than the KTM but is more manageable. Forks: The Husqvarna forks use the exact same valving as the KTM’s 4CS forks—and we mean identical as twins can be. However, most MXA test riders preferred the Husky setup. Which probably had more to do with the chassis, resilient subframe and milder power pulses than anything inherent is WP’s bag of tricks. It should be noted that these forks are valved for their target audience, which isn’t Pro riders or Supercross tracks. Shock: Since Husqvarna uses the same 48 N/m spring as the 2016 KTM 450SXF, we think anyone under 190 pounds would be better served by a 45 N/m spring. Overall handling: In a Bermuda Triangle mystery, MXA test riders liked the feel of the Husky better than the KTM, even though the geometry is the same. Again this has to do with chassis accoutrements more than actual numbers on the drafting table. Cornering: This bike is on rails. You can turn it with your knees. Handlebar input is not as sensitive as on the RM-Z450, YZ450F, CRF450 or KX450F. Shifting: It shifts as well as the KTM, which is better than every other brand. Brakes: Pucker up. Brembo has built the best brakes in motocross for the last 10 years. Over the course of that decade Brembo has refined the interplay between the rotor, caliper and master cylinder. The Husky/KTM brakes are awesome. Clutch: Bulletproof. Husky broke away from its KTM benefactor by spec’ing a Magura hydraulic clutch master cylinder. Maybe it’s just us, but we think the Magura unit has a silkier feel and more progressive release point than KTM’s Brembo master cylinder. WHAT WOULD WE CHANGE ON THE FC450? We’d get our own engineers—instead of relying on our orange competitor’s input. We would drop the molded plastic airbox concept on Husky’s motocross bikes; it’s best suited to enduro bikes. It costs horsepower and adds weight. We’d also get rid of the restrictor in the perf core. Plus, if we weighed under 190 pounds, we’d swap the stock shock spring for a lighter rate. We’d actually have different fork and shock valving than KTM—because then we would live and die by our own hand. WHAT’S NEWSWORTHY ON THE FC450? Although Husqvarna tried to carve out a niche of its own with its molded airbox and quiet muffler, we didn’t like the side effects of these changes. But, we did love the no-bolt side panels and distinctive look. Nepotism. It’s hard to ignore the coefficient of inbreeding exhibited by the consanguine marriage of KTM and Husky. 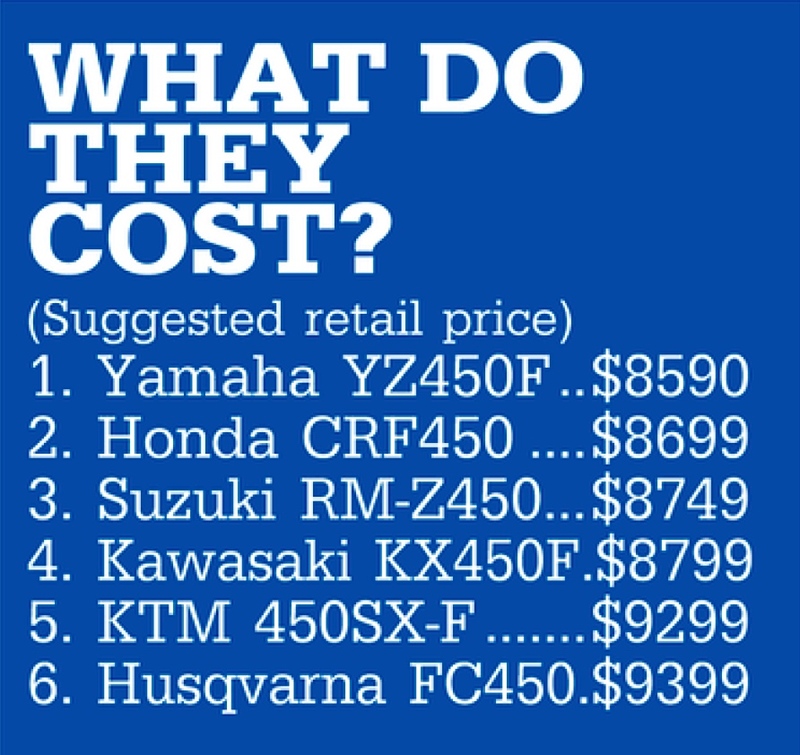 But, even without the big words, the FC450 leapfrogs over the “Big Four” Japanese brands. But, Big Brother may never let it leapfrog over them. WHY SHOULD THE 450SXF WIN THE SHOOTOUT? It should win, and it did win, because it bristles with superlatives. It is the lightest bike. It makes the most horsepower. It has the best all-around powerband. It has electric starting. It shifts like a dream. It has a hydraulic clutch. It has the best brakes. It makes the most torque. It comes with premium MX32 race tires. It has the best handling of any bike on the track. It has an air filter that requires no tools to remove or install. It has the largest-capacity fuel tank. It has quick-release fuel lines. It has billet hubs. Let’s be serious. How could the bike with the most horsepower, most torque, broadest powerband, lightest weight, strongest clutch, electric starting, easiest-to-use air filter, ODO clamp-on grips, Dunlop MX32 tires, a front number plate that hides the brake hose, quick release fuel lines (with replaceable filters) and a brake pedal with adjustable height and modulation lose this shootout to bikes that are slower, heavier, weak of clutch and old school? It can’t. WHY SHOULD THE 450SXF LOSE THE SHOOTOUT? Although the WP 4CS forks work better than they ever have and are better than some Japanese forks, they are set up for Vet and Novice riders, not for Pros. It’s cheaper to re-valve the WP forks on the KTM than it is to buy the horsepower that is missing on the competition—or pay for Hinson clutches to get close to KTM’s hydraulic unit, fix weak chain guides, Band-Aid twitchy handling, fiddle with gappy shifting—not to mention having to kick them to get them started (without the benefit of light weight in place of electric starting). We don’t like the forks, but we do like them better than several bikes equipped with Showa units. HOW MUCH HORSEPOWER DOES THE 450SXF MAKE? TORQUE? 57.98 horsepower at 9400 rpm—the most of any 450cc production bike. It makes 36.53 foot-pounds of torque—the most of any 450cc production bike. WHAT DOES THE 450SXF WEIGH? 227 pounds. The KTM 450SXF is the lightest bike in the 2016 MXA 450 Shootout. It is 2 pounds lighter than the Husky, 4 pounds lighter than the KX450F, 6 pounds lighter than the CRF450, 11 pounds lighter than the YZ450F and 13 pounds lighter than the RM-Z450. First. The KTM 450SXF won the MXA 450 Shootout in 2010, 2011, 2015 and 2016. 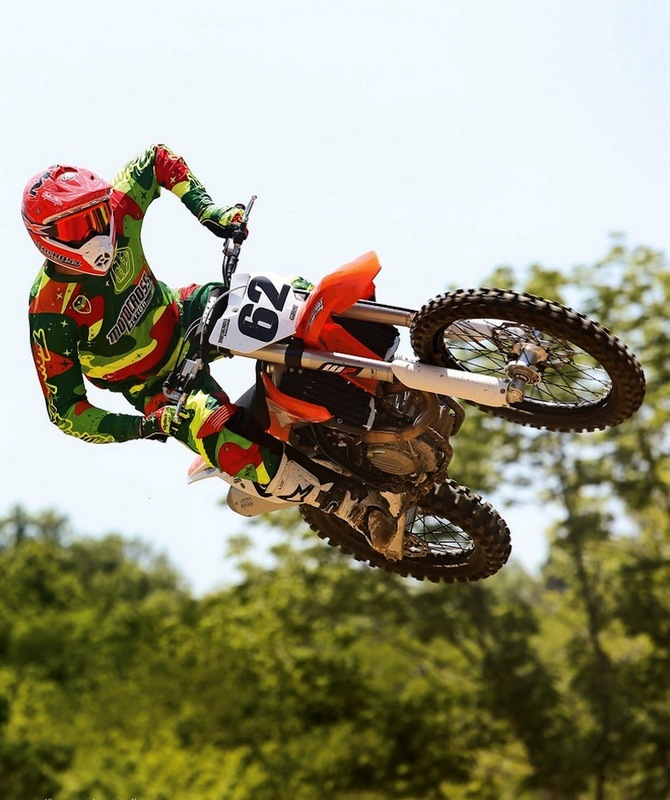 Most MXA test riders believe that this is the best all-around race bike for the average racer. And of the 10 MXA test riders we used during this four-month test, 9 out of 10 put the KTM first on their charts (the 10th chose the Husky). HOW DOES THE 450SXF RATE IN THE MAJOR CATEGORIES? Power output: Superb. Not only does it make the most power, but it meters it out across the broadest range. It just goes and goes and goes. You don’t have to shift very often because it never stops pulling. Forks: Always the weak link in KTM’s armor, the 2016 WP 4CS forks are raceable by Vets and Novices in stock trim. These aren’t Pro forks, but we don’t know any Pros who race with stock forks anyway. We sent our forks out for a $350 revalve and they were sweet. Shock: We think that the stock 2016 KTM 450SXF shock spring is too stiff for anyone under 190 pounds, but with the correct spring for your weight, this is a good shock. Overall handling: The KTM 450SXF is intuitive. It knows what you want it to do before you do it. Once you get the front and rear balanced, the KTM can track straight as an arrow over the roughest ground. Cornering: Not as sharp as a Suzuki, the KTM still carves with precision—and doesn’t have the Suzuki’s twitchy downsides. Shifting: KTM has the best shifting in the class. No missed shifts. No ghost shifts. No issues. Brakes: Awesome. Honda, Yamaha and Kawasaki went to bigger rotors, but they don’t have the modulation that the KTM’s Brembos offer. Clutch: League leading. One of only two hydraulic clutches in this shootout, KTM’s Belleville washer clutch lasts forever. WHAT WOULD WE CHANGE ON THE KTM 450SXF? We would send the forks out for a re-valve, paint the frame orange, spec a 45 N/m shock spring (for anyone under 190 pounds), install a pipe that can be removed without taking the shock off the bike and live happily ever after. WHAT’S NEWSWORTHY ON THE 450SXF? Everything on the 2016 KTM 450SXF is new, but the addition of launch control, a handlebar-mounted map switch and race-ready Dunlop MX32 tires added new dimensions to the bike. Don’t forget that we are talking about the lightest bike with awesome brakes, a bulletproof hydraulic clutch, flawless shifting, marine-grade wiring harness, quick-release fuel lines, in-line fuel filters, rubber-mounted bars, plastic frame guards, direct-connect throttle cables and in-mold graphics. Value. At $9299, this is the most expensive 450cc motocross bike on the showroom floors—and it’s worth every penny. There are six categories, that cover horsepower at 6000, 8000 and 10,000 rpm, plus peak horsepower, rpm range above 50-horsepower and foot-pounds of torque The blue color indicates the category winner). Although each number stands on its own, the rpm range Above 50 Horsepower Number tells you how long each bike could break the 50 horsepower barrier and stay there. The KTM 450SXF stayed above 50 horsepower for 4300 rpm. 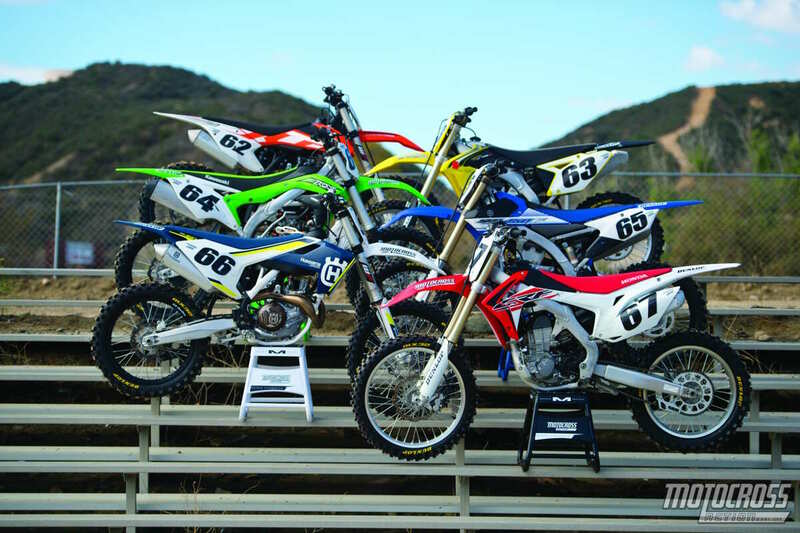 For comparison, the Honda CRF450 only stayed above 50 horsepower for a 1900 rpm range, the KX450F for 2800 rpm, the RM-Z450 for 3600 rpm, the YZ450F for 3800 rpm and the Husky FC450 for 4100 rpm. Not only did the KTM have the boradest, most usable and longest pulling powerband, but the 2016 KTM 450SXF won six of the six categories. The Husqvarna was second best in every category, although it tied for second with the KX450F in mid-horsepower (measured at 8000 rpm). Remember that these dyno numbers do not go to the starting line—you do.